20 Dec 11: The Winter 2011 Key Note (Europe/UK) is available from the website's Members' Area's Key Notes Archive. As well as a PDF version, there is a ZIP containing an eBook (.PRC) version. Parts of it may look better on devices such as Kindles but the layout is poor; the PDF is recommended. 15 Dec 11: The FISTS Brasspounder November 2011 newsletter has just been published by Rob M0BPT. Brasspounder provides news, views and results for FISTS Activities in Europe/UK. 14 Dec 11: The film "Radio Hams (Pete Smith Speciality)" from 1939 is well worth watching (there is CW content about half way through). 12 Dec 11: The final 2011 FISTS Ladder sessions are on 25th December 14:00-1600 UTC and 18:00-20:00 UTC. (FISTS in Europe but members worldwide are welcome.) It's possible there may not be as many people active on this day!! Note that the Ladder starts afresh in 2012. 03 Dec 11: The Upcoming Events list now contains 2012 events for FISTS (North America & Europe) and EUCW. For a quick reminder of events coming up over the next month or so, there is a brief list at the top right of the Home page. 02 Dec 11: The FISTS European Activities Calendar for 2012 has been released by Rob M0BPT. This includes three new activities: Titanic 24 hour sprint 2012, Counties Week 2012 and FISTS Eu Silver Jubilee Week 2012. He has also made available a 2012 year planner. 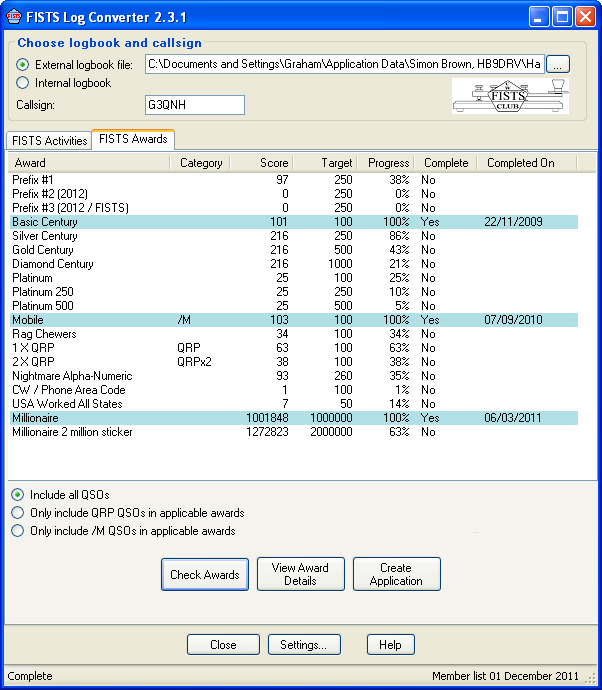 02 Dec 11: The latest version of the free FISTS Award tracking program includes the new 2012 FISTS Prefix Awards and the 2012 FISTS European Activities. FISTS Log Converter 2.3.0 makes it easy to see your progress towards awards and helps you apply for them. It can be used with your preferred Windows logbook program or if you don't have one, it provides a basic logbook too. Members entering the European FISTS Activities can also use it to prepare logs ready for submission. The program can be downloaded from its web page. 02 Dec 11: The new FISTS Prefix Awards start on 1st Jan 2012 in celebration of FISTS 25th anniversary. Each award requires contacts with 250 unique callsign prefixes. To achieve the basic award, 25 of the contacts must be FISTS members and there is no time limit. For the second version of the award, the contacts must be within the anniversary year of 2012. The third version of the award must also be achieved within 2012 and additionally all contacts must be with FISTS members. For detailed information, please see the Awards web page. 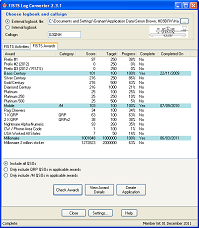 The Prefix awards are fully supported by the latest version (2.3.0) of the free FISTS Log Converter Windows program. Alternatively, printable log sheets, application forms and spreadsheets will be provided on the website. 02 Dec 11: The next FISTS Ladder sessions are on Sunday 11th December 14:00-1600 UTC and 18:00-20:00 UTC (FISTS in Europe but members worldwide are welcome). Please submit your November entries for the Ladder by the 5th December and Four Seasons by the 7th December to Rob M0BPT. 28 Nov 11: The FISTS Down Under December 2011 newsletter is now available. 28 Nov 11: Morse Inspector is a fascinating photo & description of a 1935 Bolton (UK) Borough Police Morse training session. 21 Nov 11: "Olympic magnetic bug by TWradio" shows a prototype magnetic bug key being evaluated by Sandy G0VQW, who recorded the video. The key was produced by Tom Withers, G3HGE. 16 Nov 11: The FISTS Straight Key Week (SKW) 2011 Results have just been published by Rob M0BPT. 16 Oct 11: The FISTS Brasspounder October 2011 newsletter has just been published by Rob M0BPT. Brasspounder provides news, views and results for FISTS Activities in Europe/UK. 16 Nov 11: The next FISTS Ladder sessions are on 27th November 14:00-1600 UTC and 18:00-20:00 UTC. (FISTS in Europe but members worldwide are welcome.) QSOs are casual and friendly, so you can just come along to say "Hello" and meet other members. Most activity takes place around 3.558 MHz, 7.028 MHz and 14.058 MHz. Logs are much appreciated but not essential. 07 Nov 11: The FISTS Mobile Award is being withdrawn on 1st January 2012. Note that there is a new award being introduced in 2012 in celebration of FISTS' 25th Anniversary - details to follow! 02 Nov 11: The next FISTS Ladder sessions are on Sunday 13th November 14:00-1600 UTC and 18:00-20:00 UTC (FISTS in Europe but members worldwide are welcome). Please submit your October entries for the Ladder by the 5th November and Four Seasons by the 7th November to Rob M0BPT. If you keep your log on a computer, you can use the free FISTS Log Converter Windows program to create logs with scores for the Ladder, Four Seasons and other FISTS Activities and Awards. 02 Nov 11: Congratulations to Gene W5GXV, #11347 on winning the FISTS Millionaire Award 17 Million sticker. 29 Oct 11: "Marconi 365B" shows a Marconi 365B key in use by Sandy G0VQW, who recorded the video. 28 Oct 11: The FISTS Down Under November 2011 newsletter is now available. 25 Oct 11: "Titanic Liverpool 1" shows a Morse recording session for Liverpool Maritime Museum (UK) by FISTS members Bill G0JWB, Rich G4FAD and Sandy G0VQW, who also produced the video. The Morse is for a Titanic exhibit that is being prepared for display in March 2012. 24 Oct 11: Congratulations to Derek M0DRK, #8344 on winning the FISTS Platinum award. The award requires receiving 100 Century Certificate (CC) numbers over the air from other members. 18 Oct 11: Congratulations to George M6GAH, #15553 on achieving his intermediate licence, full licence and new callsigns 2E0FSK and M0HAJ. 18 Oct 11: Congratulations to Billy M0JHA, #12589 on winning both the Basic Century and 1 X QRP Awards. 17 Oct 11: Would you like a QSO with Chile? David CE2WZ is happy to set up skeds with FISTS members who need Chile on CW. He has 10m, 12m, 15m, 17m, 20m and 40m and can be contacted by email. 16 Oct 11: The FISTS Brasspounder September 2011 newsletter has just been published by Rob M0BPT. Brasspounder provides news, views and results for FISTS Activities in Europe/UK. 12 Oct 11: The Autumn 2011 Key Note (Europe/UK) is available from the website's Members' Area's Key Notes Archive. As well as a PDF version, there is a ZIP containing an eBook (.PRC) version; this may look better on devices such as Kindles, however, the PDF version is recommended. 11 Oct 11: The next FISTS Ladder sessions are on Sunday 23rd October 14:00-1600 UTC and 18:00-20:00 UTC. (FISTS in Europe but members worldwide are welcome.) QSOs are casual and friendly, so you can just come along to say "Hello" and meet other members. Most activity takes place around 3.558 MHz, 7.028 MHz and 14.058 MHz. Logs are much appreciated but not essential. 10 Oct 11: The October edition of "morsEAsia" from FISTS East Asia is available along with Morse code versions of articles at 10, 15, 20, 25 and 30wpm. The First Class CW Operators Club is inviting the participation in one of its regular monthly events by other CW users on the 80m band. For the last few months a successful Straight Key Evening has been organised and this takes place on the third Wednesday of each month. The FOC Club Station G4FOC is active from 1900z until 2200z encouraging the use of pump (straight) key, bug key or the sideswiper (cootie). The operation is around 3525 KHz and although this is not a competitive event, participants are encouraged to work as many stations as possible exchanging key details and signal reports to both FOC member and non member alike. No logs need to be sent in and all non FOC members are invited to join the Straight Key Weekend at the end of December 2011. A warm welcome will be received to all non club participants in these events. For the remainder of 2011 the SKE event dates are October 19th, November 16th and December 21st. The SKW is December 31st and January 1st taking place on all bands. 03 Oct 11: The Fall Sprint takes place Saturday 8th October 2011, 1700-2100 UTC (FISTS in North America but members worldwide are welcome). 02 Oct 11: The video Paddle Rescue shows a unique minimalist straight key - well worth a view! 01 Oct 11: The next Ladder sessions (FISTS in Europe but members worldwide are welcome) are on Sunday 9th October 14:00-1600 UTC and 18:00-20:00 UTC. Please submit your September entries for the Ladder by the 5th October and Four Seasons by the 7th October to Rob M0BPT. If you keep your log on a computer, you can use the free FISTS Log Converter Windows program to create logs with scores for the Ladder, Four Seasons and other FISTS Activities and Awards. 30 Sep 11: Congratulations to Phil M6PHL, #14543 on achieving his intermediate licence and new callsign 2E0DPH. 23 Sep 11: We're very sorry to have to report that Dawson Thompson, G3AHS, FISTS #265, became a Silent Key on 21st September 2011. Dawson was active on the air until recent weeks and very well known to many members. 22 Sep 11: The FISTS Down Under September 2011 newsletter is now available. 20 Sep 11: There's a new band plan for 6m in IARU Region 1 starting in 2012. The UKSMG have provided a video about it, a summary and the full band plan. 19 Sep 11: "KPH: The Wireless Giant" is a short YouTube video about KPH (coastal station on the USA West coast), including its closure and re-opening. 16 Sep 11: Ian Fulton, G4XFC, has started an educational campaign "The Morse Crusade" that promotes teaching Morse characters at operational speeds, such as using the Koch method and Farnsworth spacing. For more information, please visit Ian's website. 15 Sep 11: The FISTS Brasspounder August 2011 newsletter has just been published by Rob M0BPT. Brasspounder provides news, views and results for FISTS Activities in Europe/UK. 13 Sep 11: "Straight Key Week (Fists)" is a new YouTube video by Sandy G0VQW, FISTS #3739, showing him using a Marconi Nato key to participate in SKW 2011. It features many well known UK FISTS members on the air. 13 Sep 11: Heathkit have announced this on their website: "Based on your input, we are looking at developing amateur radio kits. Our goal is to have kits available by the end of year." If you are thinking of having a Free Morse Test at the UK National Hamfest (Newark, 30th September - 1st October) and would like to pre-book it, it is now possible by sending an email. Logs must be received by Monday 26th September 2011. Thanks to everyone who joined in and made this such a fun week. 06 Sep 11: Stan K4UK is operating this week as KN0WCW during the FISTS Straight Key Week 2011 (SKW). Listen out for him around 14.058 MHz and possibly 21.058 MHz. KN0WCW is the FISTS North American club callsign and is worth 5 points in SKW and for the Century series of FISTS Awards. We'd be very pleased to work FISTS members and hope that a contact with us would credit for the FISTS award (as I am a FISTS member). Also, not relevant for the VK members, but we have received authorisation to operate on 60 metres, which will certainly be of interest to some members. All the details of our operation are on our web site, as well as a Guest book where people can leave questions, comments etc. As usual with such ventures, we have a fair freight charge we'll need to pay, so any small donations will be gratefully received. Hope to hear you guys from YJ0. 30 Aug 11: Essex (UK) Morse Classes: Weekly Morse code classes will take place at Danbury near Chelmsford starting Thursday, September 1, newcomers are welcome. The Morse classes will be held in the meeting room at Danbury village hall at 7pm, September 1. Newcomers to morse code are welcome as well as those who wish to improve their speed or the use of the paddle key. The class will be taken by Andrew, G0IBN, who is now the official RSGB morse test examiner for the area. The Chelmsford Amateur Radio Society (CARS) run training courses for the Amateur Foundation, Intermediate and Advanced exams. 29 Aug 11: The FISTS Straight Key Week 2011 (SKW) runs from Sunday 4th September 00:01 to Saturday 10th September 23:59. 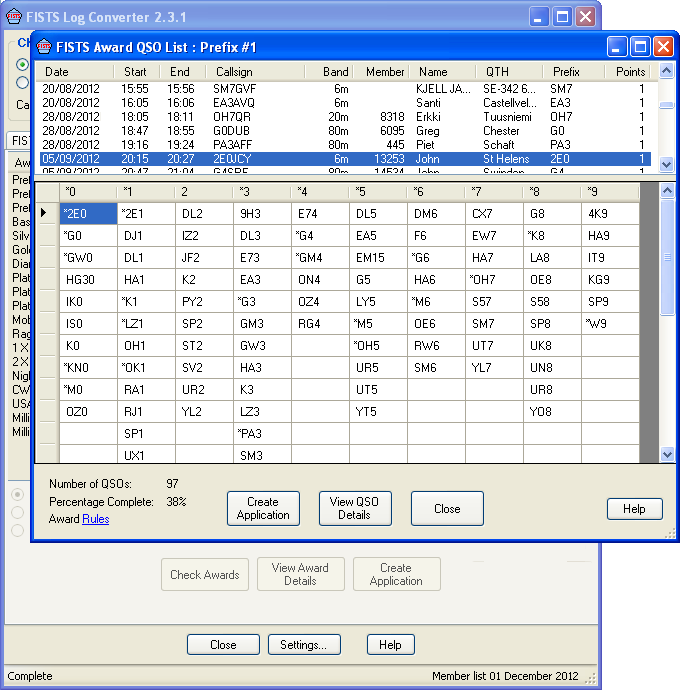 The FISTS Log Converter Windows program can be used to create a log and score for Straight Key Week; just record the FISTS member numbers in your electronic logbook's comments / remarks, e.g. FISTS 765432. 29 Aug 11: FISTS North America's International G3ZQS Memorial Straight Key Contest runs from Friday 2nd September 23:00 UTC to Sunday 4th September 23:00 UTC. 29 Aug 11: Strictly Come Dancing's judge Len Goodman has visited the Lagan Valley Amateur Radio Society to learn about Morse code in preparation for filming a BBC series of three programmes "Titanic and Me". These will be shown in 2012 to commemorate the 100th anniversary of the sinking of Titanic. For more information please see the Ulster Star article. 23 Aug 11: Thanks to John M0JCD (Nantwich, Cheshire) for joining the low speed sked scheme. For more information, please see (for privacy reasons, FISTS members only) Slow Speed Morse (QRS) Contacts scheme. North American members: if you would like to arrange skeds or volunteer to help, please consider joining the FISTS North America Code Buddy Program, details available from Nick K3NY . 22 Aug 11: Heathkit have announced on their home page that they are coming back into the kit business. They don't mention ham radio kits, but are inviting feedback on what kits they should provide by email. 22 Aug 11: There is now a handy list of "Upcoming Events" towards the top right of the FISTS home page. It also links to a larger version on a new Upcoming Events web page, where there is more space available. The main focus is on FISTS events worldwide. 22 Aug 11: The next Ladder sessions (FISTS in Europe but members worldwide are welcome) are on Sunday 28th August 14:00-1600 UTC and 18:00-20:00 UTC. QSOs are casual and friendly, so you can just come along to say "Hello" and meet other members. Most activity takes place around 3.558 MHz, 7.028 MHz and 14.058 MHz. Logs are much appreciated but not essential. 21 Aug 11: We're pleased to have Pol G3HAL as the latest station available for arranging low speed Morse skeds. For more information, please see (for privacy reasons, FISTS members only) Slow Speed Morse (QRS) Contacts scheme. 21 Aug 11: Samuel Morse's Reversal of Fortune is a Smithsonian article documenting Samuel Morse's failure as a painter then subsequent success in telegraphy. 21 Aug 11: The FISTS Brasspounder July 2011 newsletter has just been published by Rob M0BPT. Brasspounder provides news, views and results for FISTS Activities in Europe/UK. 15 Aug 11: Congratulations to Matt 2E0FNG, #14881 on achieving his full licence and new callsign M0ZAI. NOTE: Starting in 2011, the contest is held on a SUNDAY (not Saturday as was previously the case). In addition, we have tightened the frequency bands as noted below. FISTS and HTC are member societies of EUCW (The European CW Association). 11 Aug 11: FISTS will be attending the Telford Hamfest (UK) on Sunday 4th September 2011, so please come and say hello. The doors open at 10:30am and maps etc. are available on the Telford Hamfest website. Here is a special invitation for you to join in the fun during the First Class CW Operators Club QSO Party (FOCQP), formerly known as the Bill Windle QSO Party (BWQP) that FOC schedule twice a year. Many operators throughout the world have reported this is one of their favourite operating events. The idea behind the FOCQP is to offer a stress-free opportunity for FOC members to meet and greet both other members and non-members alike. Each one of us can make this event what you want it to be - some get on for a few casual QSOs, others spend several hours on different bands and still others treat it like a mini FOC Marathon Contest. The basic concept is to work as many stations as you can over the 24 hour period. All of the contacts made during the FOCQP count for the FOC awards if you are a member. So if you are chasing club points this is a good opportunity to fill in the stations you still need to work. As a non-member you will be welcomed as a worthy contact and you could be eligible for an award depending on your score. The FOCQP runs for a 24-hour period from 0000z to 2359z. Call 'CQ BW' from 015 to 040kHz on all bands, excluding the WARC bands, on October 22nd and 23rd 2011 and the exchange is RST, name, and FOC number (non-members send RST and name). Many also engage in longer QSOs; it is entirely up to you! Please note we still call 'CQ BW' to initiate a QSO, a tribute to Bill Windle (G8VG) who did so much to foster activity in our Club. Please send your exchange as 'G4FOC de KZ5D 599 ART 1761' if you are a member and if you are a non member your report and name in your reports. If you are interested in reporting your results during a FOCQP, simply send in the total number of contacts and the total number of FOC QSOs by email to KZ5D. Reports should be something like '145/120', indicating 145 total contacts of which 120 were with FOC members. No logs are required because we work on the honour system. Reports are due one week after the event. A complete list of the stations who report will be included in FOCUS and on our public website. Handsome certificates are awarded to members and non-members on each continent reporting the highest number of QSOs. Hope to see you on the bands then! 08 Aug 11: "Portable radio operations Pembrokeshire" is a new YouTube video by Sandy G0VQW, FISTS #3739, showing his /P CW operations in Wales. 07 Aug 11: Paul M0PNN, FISTS #14593, will be on Guernsey (Channel Isles) August 19-24 with the Telford and District Amateur Radio Society GP3ZME/P Guernsey Expedition. Paul, under MU0PNN/P or GP3ZME/P, will be calling CQ FISTS on 80 meters 3.558 and 20 meters 14.058. He will also be taking 6 meters equipment: a two element HB9CV and 9 element Tonna for 2 meters. The HF antennas are a full size G5RV and a H-422 rotatable trap dipole. Paul will accept QSL cards from FISTS members via the FISTS bureau or direct to himself. HF 80 Meters to 10 Meters. You may follow the DX Expedition on twitter; 2W0ZJA will be tweeting updates to frequencies etc. http://twitter.com/#!/daiboy250. VHF talk back and ON4KST chat may also be used. Locator Square of the camping site is IO89QK but members of the group may well move around the island looking for the best paths to UK, EU etc. Hope to enter the 50MHz UKAC on the 23rd August. The main objective of the Expedition is to have fun especially on SHF. QSL if needed Via G3ZME (bureau). For details of direct QSL please use the email address on qrz.com. For more information about Telford and District Amateur Radio Society please Visit www.tdars.org.uk. The FOC Straight Key Weekend was well supported last year by both members and non members alike and the FOC Committee has once again agreed the weekend can be part of the CW calendar. The idea is not to have a contest but to be active using any mechanical keys such as the semi automatic bug, the side swiper or the pump straight key across all bands 25 KHz up. Whilst many operators use the electronic keyer there are still a sizeable number who are proficient on the older style keys and FOC recognises the value of preserving these old yet valuable skills. The weekend of the 31st December 2011 and 1st of January 2012 has been suggested as the first available weekend with many other organisations sharing this slot for straight key activities and FISTS club operators are invited to join FOC on all bands with your straight key, bug key or any other mechanical keying device, (We leave it up to you!). The timing will follow the FOC BWQP event timing and start at 0000z and finish at 2359z over the Saturday and Sunday weekend. There are no prescribed operating bands or times - just be active as band conditions permit. It would be helpful if CW club editors could put this information on club reflectors. Please send your comments on contacts and perhaps photographs of the keys used to G3VTT by e-mail or post them (QTHR) before the end of January. A log is not needed but comments about the types of keys heard and the best 'fist' would make interesting reading. The FOC Public Website is at www.g4foc.org. 04 Aug 11: Jari OH6DC has built a CW transmitter powered by a straight key. For details, photographs and a video, see his web page. 01 Aug 11: The next Ladder sessions (FISTS in Europe but members worldwide are welcome) are on Sunday 14th August 14:00-1600 UTC and 18:00-20:00 UTC. Please submit your July entries for the Ladder by the 5th August and Four Seasons by the 7th August to Rob M0BPT. If you keep your log on a computer, you can use the free FISTS Log Converter Windows program to create logs with scores for the Ladder, Four Seasons and other FISTS Activities and Awards. 31 Jul 11: The short Portishead Radio (GKA) documentary includes a ringing endorsement of CW, despite its declining use at the time. 24 Jul 11: FISTS Down Under have made a podcast of a documentary in recognition of the advent of the Wellington maritime radio station ZLW in 1911. This documentary also features the Morse Code. ZLW was well known to ships radio officers around the world, many of whom are FISTS Club members. 21 Jul 11: The Summer 2011 Key Note (Europe/UK) is available from the website's Members' Area's Key Notes Archive. As well as a PDF version, there is a ZIP containing an eBook (.PRC) version; this may look better on devices such as Kindles. 21 Jul 11: The next Ladder sessions (FISTS in Europe but members worldwide are welcome) are on Sunday 24th July 14:00-1600 UTC and 18:00-20:00 UTC. QSOs are casual and friendly, so you can just come along to say "Hello" and meet other members. Most activity takes place around 3.558 MHz, 7.028 MHz and 14.058 MHz. Logs are much appreciated but not essential. 20 Jul 11: Rob M0BPT has just published the FISTS Brasspounder June 2011 newsletter. Brasspounder provides news, views and results for FISTS Activities in Europe/UK. 19 Jul 11: The New York Times has a very good article For a Night Each Year, the Airwaves Buzz With Morse Code about the annual commemoration of the closure of coastal stations, focusing on KPH (Northern California). 19 Jul 11: Fancy building a telegraph sounder? The web page Telegraph Clacks out RSS Feeds shows details and lots of photographs of constructing a brass telegraph sounder, based on historical plans. 15 Jul 11: There is a fascinating web page with recordings of CW (Morse) from coastal stations and shipping from the days when Morse was King. Thanks to FISTS member Tony G3ZRJ for providing details of the page. 11 Jul 11: Congratulations to Paul 2E0EAN/M6ABN, #14564 on achieving his full licence and new callsign M0PNA. 11 Jul 11: FISTS East Asia have provided a Morse version (MP3 audio files) of their recent July newsletter "morsEAsia" at www.feacw.net/snd/ . This includes speeds of 10, 15, 20, 25 and 30wpm. 09 Jul 11: The EUCW QRS Party results 2011 have been published by Rob M0BPT, FISTS Activities Manager. 05 Jul 11: Ever seen a giant straight key in use? Now is your chance - see the description and video. 04 Jul 11: The Summer Sprint (FISTS in North America but members worldwide are welcome) takes place this coming Friday 8th July 2011, 20:00-00:00 EDT (note: in UTC this is Saturday 9th 00:00-04:00). For more information, please see the Sprint web page. 01 Jul 11: There's a very entertaining, helpful and humerous US Army training film from 1966 on hand-sending Morse and adjusting keys, entitled "INTERNATIONAL MORSE CODE, HAND SENDING". Part of the film covers American-style hand/arm positioning, but the majority of the film is very relevant to all styles of sending. 01 Jul 11: The next Ladder sessions (FISTS in Europe but members worldwide are welcome) are on Sunday 10th July 14:00-1600 UTC and 18:00-20:00 UTC. Please submit your June entries for the Ladder by the end of 5th July and Four Seasons by the 7th July to Rob M0BPT. If you keep your log on a computer, you can use the free FISTS Log Converter Windows program to create logs with scores for the Ladder, Four Seasons and other FISTS Activities and Awards. 27 Jun 11: "Two new friends" is a new YouTube video by Sandy G0VQW FISTS #3739 demonstrating two keys he purchased at the Newbury radio rally. 22 Jun 11: Rob M0BPT has just published the FISTS Brasspounder May 2011 newsletter. Brasspounder provides news, views and results for FISTS Activities in Europe/UK. 20 Jun 11: The next Ladder sessions (FISTS in Europe but members worldwide are welcome) are on Sunday 26th June 14:00-1600 UTC and 18:00-20:00 UTC. QSOs are casual and friendly, so you can just come along to say "Hello" and meet other members. Most activity takes place around 3.558 MHz, 7.028 MHz and 14.058 MHz. Logs are much appreciated but not essential. 03 Jun 11: The next Ladder sessions (FISTS in Europe but members worldwide are welcome) are on Sunday 12th June 14:00-1600 UTC and 18:00-20:00 UTC. Please submit your May entries for the Ladder by the end of 5th June and Four Seasons by the 7th June to Rob M0BPT. If you keep your log on a computer, you can use the free FISTS Log Converter Windows program to create logs with scores for the Ladder, Four Seasons and other FISTS Activities and Awards. 27 May 11: Elecraft have added provisional specifications and videos from Dayton of their new KX3 multimode 160m-6m QRP portable transceiver to their website. 18 May 11: Rob M0BPT has just published the FISTS Brasspounder April 2011 newsletter. Brasspounder provides news, views and results for FISTS Activities in Europe/UK. 16 May 11: We're delighted to welcome our latest members: Steve W5BIB #15529 and Armando M0PAM #15530. 16 May 11: The next Ladder sessions (FISTS in Europe but members worldwide are welcome) are on Sunday 22nd May 14:00-1600 UTC and 18:00-20:00 UTC. QSOs are casual and friendly, so you can just come along to say "Hello" and meet other members. Most activity takes place around 3.558 MHz, 7.028 MHz and 14.058 MHz. There's no need to send in logs, but they are welcomed. 09 May 11: The FISTS North America Spring Sprint takes place this coming Saturday 14th May 2011, 1700-2100 UTC. FISTS members worldwide and non-members are welcome to join in. For more information, please see the Sprint web page. 08 May 11: We're very pleased to welcome our latest member: Sven LA1MSA #15528. 02 May 11: Congratulations to Thomas 2E0ETT/M6TTH, #14893 on achieving his full licence and new callsign M0TRN. 02 May 11: The next Ladder sessions (FISTS in Europe but members worldwide are welcome) are on Sunday 8th May 14:00-1600 UTC and 18:00-20:00 UTC. Please submit your April entries for the Ladder by the end of 5th May, Four Seasons by the 7th May and logs for the EUCW QRS Party by 31st May to Rob M0BPT. If you keep your log on a computer, you can use the free FISTS Log Converter Windows program to create logs with scores for the Ladder, Four Seasons and other FISTS Activities. 26 Apr 11: A very warm welcome to our latest members: John M0GWQ #15525, Juan EA1AER #15526 and Paul G0WAT #15527. 22 Apr 11: The EUCW QRS Party runs from this coming Monday 25th April 00:01 UTC to Friday 29th April 23:59 UTC. Maximum speed is 14 WPM. This is not a contest, but you are encouraged to submit logs to Rob M0BPT. The EUCW QRS Party is organised by FISTS, so please help support it. EUCW is an association of European CW clubs. 22 Apr 11: Rob M0BPT has just published the FISTS Brasspounder March 2011 newsletter. Brasspounder provides news, views and results for FISTS Activities in Europe/UK. 19 Apr 11: It's a pleasure to welcome our latest members: George G0XGK 15523 and Phil G0NVT 15524. 18 Apr 11: The Hellenic Amateur Radio Association of Australia will be conducting a DXpedition to Lord Howe Island in July 2011. We are looking for CW operators who may wish to attend. More details are on the VK9HR web site or please contact VK2IR Tommy by email. 12 Apr 11: We're delighted to welcome our latest members: Ian G0CTO #15519, Brian G4JAJ #15520, Terry G0PIL #15521 and Iain M1RPW #15522. 12 Apr 11: The next Ladder sessions (FISTS in Europe but members worldwide are welcome) are on Sunday 24th April 14:00-1600 UTC and 18:00-20:00 UTC. Please come and join us for some friendly QSOs. It's not necessary to submit logs, but they are very welcome. 08 Apr 11: We're very pleased to welcome our latest member: Mike M0OZH #15518. 06 Apr 11: Rob M0BPT has published the Exchange Your Age Week 2011 results. 05 Apr 11: The next Ladder sessions (FISTS in Europe but members worldwide are welcome) are on Sunday 10th April 14:00-1600 UTC and 18:00-20:00 UTC. Please submit your March entries for the Ladder by the end of today (5th April) and Four Seasons by the 7th April to Rob M0BPT. If you keep your log on a computer, you can use the free FISTS Log Converter Windows program to create logs with scores for the Ladder, Four Seasons and other FISTS Activities. 05 Apr 11: FISTS will be attending the UK NARSA Rally at the Norbreck Exhibition Centre, Blackpool this coming Sunday 10th April, so please come and say hello. This was a lively event last year with a wide range of club and trade stands, well worth a visit. The doors open at 11am and maps etc. are available on the NARSA website. 03 Apr 11: Congratulations to Greg W8VIJ #8190 on achieving the Silver Century Award and to Graham G3ZOD #8385 on achieving the Millionaire Award. 01 Apr 11: The new 3 month season (Spring) in the FISTS Four Seasons Activity starts today. This is open to FISTS members worldwide. During the three months, contacts that are 5 minutes or longer are eligible, with extra points for each 5 minutes up to 30 minutes per QSO and 90 minutes per station per month. The contacts don't have to be with FISTS members, although there are further points for those that are. So why not have some fun with this and send your monthly logs to Rob M0BPT? The free FISTS Log Converter Windows program can help by creating log submissions with scores for the Four Seasons and other FISTS Activities. For full details of the rules, please visit Four Seasons Activity. 31 Mar 11: The "Fist on the Air Award" starts tomorrow, 1st April 2011. This is open to members of FISTS in Europe/UK and runs for 12 months, at which point prizes of three Czech Morse keys will be presented to the top three members. Points will be accumulated from the Ladder, Four Seasons, Straight Key Week and Exchange Your Age Week activities between 1st April 2011 and 31st March 2012, with each activity contributing equally. So, to be in with a chance of winning a key, join in as many of these activities as you can! Thanks to Mike Bowthorpe, G0CVZ, #14554 from Czech Morse Keys for donating these excellent prizes. 25 Mar 11: We're sorry to report that members Brian G0AQJ #258 and Alan G0RJM #9845 are Silent Keys. 24 Mar 11: A very warm welcome to our latest members: Jonathan G0SDT #15515, Timo OH5FNI #15516 and Ian G4RVG #15517. 23 Mar 11: The Spring 2011 Key Note (Europe/UK) is available from the website's Members' Area's Key Notes Archive. 18 Mar 11: Rob M0BPT has just published the FISTS Brasspounder February 2011 newsletter. Brasspounder provides news, views and results for FISTS Activities in Europe/UK. 17 Mar 11: Maritime Radio Day 2011 is being held 14/15th April. Information is available at the Maritime Radio Day website. GB0GKA (GKA is Portishead Radio) will be operated by Tony G3ZRJ, FISTS #7727. 17 Mar 11: We're delighted to welcome our latest members: Abie AB1EH #15511, Hans BX2ABT/PA2BX #15512, Bart ON4CCU #15513 and Colin M1OCN #15514. 16 Mar 11: The next Ladder sessions (FISTS in Europe but members worldwide are welcome) are on Sunday 27th March 14:00-16:00 UTC and 18:00-20:00 UTC. UK members please be aware that due to the clocks moving forward, the local times have changed to 15:00-17:00 BST and 19:00-21:00 BST. Note that contacts lasting 5 minutes or longer can also be submitted in Four Seasons Activity logs. 16 Mar 11: Please submit your Exchange Your Age Week 2011 logs by Tuesday 22nd March to Rob M0BPT. 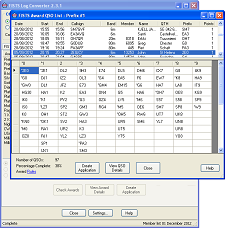 If you keep your log on a computer, you can use the free FISTS Log Converter Windows program to create logs with scores for the Ladder, Four Seasons and other FISTS Activities and Awards. Note that contacts lasting 5 minutes or longer can also be submitted in Four Seasons Activity logs. 11 Mar 11: Portable in Herefordshire (SOTA setup) (YouTube video) shows FISTS member Sandy G0VQW out in the field demonstrating SOTA to fellow FISTS members Tony G3ZRJ and Rich G4FAD. 10 Mar 11: We're very pleased to welcome our latest members: Neil MW0ECX #15508, Brian G8NHN #15509 and Sunil 9N-SWL-1 #15510. 08 Mar 11: FISTS club calls GX0IPX #1 and GX3ZQS #2 should be on the air from around 10:00 UTC on Wednesday 9th March and Thursday 10th March. Bands are likely to be 80m and 20m. For Exchange Your Age Week 2011 both callsigns are worth 5 points. For the purposes of the Century series of awards, GX0IPX is worth 5 points and GX3ZQS is worth 3 points. 08 Mar 11: Congratulations to Thomas M6TTH, #14893 on achieving his intermediate licence and new callsign 2E0ETT. 04 Mar 11: Exchange Your Age Week 2011 (EYAW) starts this coming Sunday 6th March 00:01 UTC and runs continuously for 7 days. FISTS members worldwide are welcome to join in. QSOs are very relaxed with (at a minimum) an exchange of name, QTH, member number and age. They can be with members and non-members on any band except for 30m, 17m and 12m. It's not necessary to submit a log afterwards, but they are very much appreciated. Even if you're not competitive, it's an excellent opportunity to come on the air and meet old friends and make new ones. For the full details, please see Exchange Your Age Week 2011. 03 Mar 11: It's a pleasure to welcome our latest members: Simon G1VGM/G2CNN #15505, Graham G3UD #15506 and Anthony M0ZZA #15507. 03 Mar 11: Congratulations to Peter M0CYR, #10897 and Graham G3ZOD, #8385 on achieving the Basic Century Award. 28 Feb 11: The next Ladder sessions (FISTS in Europe but members worldwide are welcome) are on Sunday 13th March 14:00-1600 UTC and 18:00-20:00 UTC. Remember that Ladder contacts lasting 5 minutes or longer can also be submitted in Four Seasons Activity logs. Please submit your February entries for the Ladder by the 5th March and Four Seasons by the 7th March to Rob M0BPT. If you keep your log on a computer, you can use the free FISTS Log Converter Windows program to create logs with scores for the Ladder, Four Seasons and other FISTS Activities. 25 Feb 11: A very warm welcome to our latest member: Peter G0OMH #15504. 19 Feb 11: During the evenings (UTC) of the coming week, Mon 21st - Fri 25th February, Martin, DL1GBZ / IK2RMZ, FISTS #853, will be using the call DA2MORSE at the upper end of the 80m CW area. You can also apply for a QSO by sending a request to the trustee DJ4EY. The call will be QRV all 2011, activated by the FMC (The Friends of S.F.B. Morse Club) in celebration of Samuel Morse's 220th birthday. For more information, please see the DA2MORSE QRZ.COM entry. 18 Feb 11: We're delighted to welcome our latest member: Ray G3XLG #15503. 15 Feb 11: Rob M0BPT has just published the FISTS Brasspounder January 2011 newsletter. 14 Feb 11: The next Ladder sessions are on Sunday 27th February 14:00-1600 UTC and 18:00-20:00 UTC. Ladder contacts that are 5 minutes or longer can also be submitted in Four Seasons Activity logs. 11 Feb 11: We're very pleased to welcome our latest members: Kevin GW0KIG #14899, Roger G4OWG #15500, Pavel UU3JU #15501 and Luiz PY1EPU #15502. After a successful course that ran in 2010 with much interest, Steve Hartley G0FUW and crew have announced next dates for the Morse code training course. This year the course will run from March 30 until mid June. Anyone interested in the course will be delighted to know that no knowledge or equipment is required; all you need is a pen, some paper and the enthusiasm to learn the code. Each week more letters to the mix in a proven method thus increasing your Morse knowledge in a steady fashion. Later in the course as you understand the alphabet and numbers more on air etiquette is explored, and some fun games are played to allow you retain the knowledge you have gained. At the end of the course candidates can sit the RSGB competency test at a speed that suits them best. Again this year Assessment will be conducted by Robin Thompson (G3TKF). The lessons and test all take place at the Scout HQ in Bath. Each meeting is held on Thursday evenings at 7PM. For more information please email Steve Hartley on g0fuw<at>tiscali.co.uk or call him on 01225 464394. 04 Feb 11: It's a pleasure to welcome our latest members: Martin G4ZMR #14897 and Greg G4CUI #14898. 04 Feb 11: News items are now posted to our new Twitter and Facebook pages in addition to the existing RSS feed. 01 Feb 11: The first FISTS North America Sprint of the year takes place on Saturday 12th February 2011, 1700-2100 UTC. FISTS members and non-members are welcome to join in. For more information, please see the Sprint web page. 28 Jan 11: A very warm welcome to our latest members: Joakim SA5ACN #14895 and Vincenzo IZ0RUS #14896. R. D. Walker, 87A Whitehall Road, West Bromwich, B70 0HG, England, UK. Small print: Only members of FISTS in Europe can make nominations or be nominated. The following callsigns are not eligible: M0AVW, M0BLT, M0BMN, M0BPT, M0CDL and G3ZOD. 26 Jan 11: The next Ladder sessions are on Sunday 13th February 14:00-1600 UTC and 18:00-20:00 UTC. Remember that Ladder contacts that are 5 minutes or longer can also be submitted in Four Seasons Activity logs. Please submit your January Ladder entries by the end of Saturday 5th February to Rob M0BPT. If you keep your log on a computer, you can use the free FISTS Log Converter Windows program to create logs with scores for the Ladder and other FISTS Activities. 21 Jan 11: We're delighted to welcome our latest members: Ian G4WTF #14892, Thomas M6TTH #14893 and Steve G0PQB #14894. 20 Jan 11: Rob M0BPT has just published the FISTS Brasspounder December 2010 newsletter. 18 Jan 11: There's a new version (2.2.0) of the FISTS Log Converter program available. It adds the ability to include QSL details in the internal logbook, detects contacts with the same station during both Ladder sessions on a single Sunday and clears the few known bugs. To download a copy, please visit the FISTS Log Converter web page. 14 Jan 11: We're very pleased to welcome our latest members: Lee G0AMU #14884, Eric ON4MIC #14885, Mads LA1TPA #14886, Richard G4MKR #14887, Mike G0ISO #14888, Josef OE6JTD #14889, Martin EI9GCB #14890 and Mike G4SMB #14891. 10 Jan 11: The Winter 2010 Key Note is available on the website from the Members' Area's Key Notes Archive. 10 Jan 11: The next Ladder sessions are on Sunday 23rd January 14:00-1600 UTC and 18:00-20:00 UTC. Remember that Ladder contacts that are at least 5 minutes can count towards the new Four Seasons activity. 07 Jan 11: It's a pleasure to welcome our latest members: Matt 2E0FNG #14881, Gordon MM0GSS #14882 and Paul 2E0KDM #14883. 01 Jan 11: Happy New Year! The first 3 month season (Winter) in the new FISTS Four Seasons Activity starts today, so how about joining in? This runs for 24 hours a day, 7 days a week and CW contacts that are 5 minutes or longer are valid with extra points for longer contacts and contacting stations who have FISTS member numbers. There are separate sections for QRP and QRO enthusiasts. Send monthly logs to Rob M0BPT. The free FISTS Log Converter Windows program can help by creating log submissions with scores for the Four Seasons and other FISTS Activities.